Growing up, I used to run around in corn fields, picking ears and chucking them at my siblings, or the neighbor kids. (Yea, didn’t know that the farmers used that to feed their dairy cows, my bad). 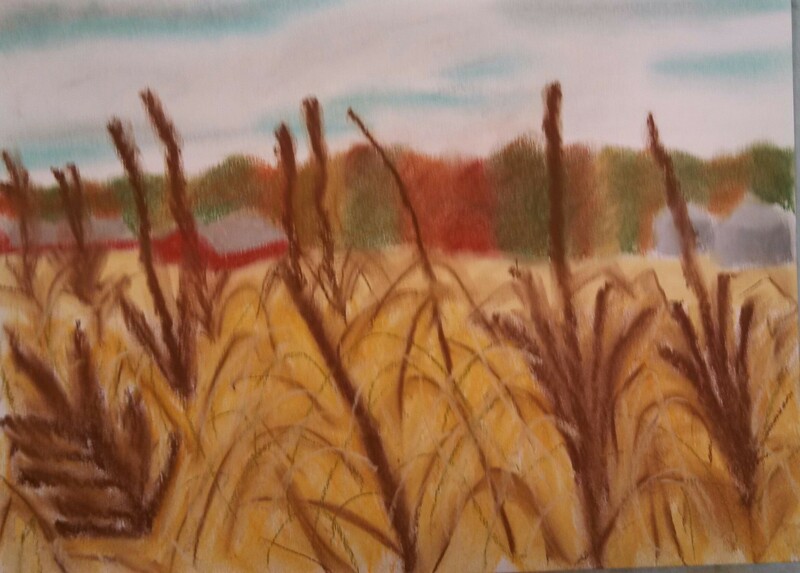 Since I am a little homesick, I decided to create a pastel portrait harvest time. This is one of the local farms along the treeline that is changing colors, big red barns, and the grey grain bins on the right side. In the foreground, there is a mature corn crop ready to harvest. My favorite part of this pastel painting is actually the bright blue color of the sky. I actually left the paper white, and used smudging to add blue. ← Those self-centered, evil, no-good farmers are out to poison the world!